Updated every 5 minutes with the latest Baltimore County Homes For Sale and real estate for sale in Baltimore County - including MLS listings, homes, condos, townhomes, investment property, and land - as posted by Baltimore County real estate agents and brokers - over 30% more listings than Zillow, Realtor, Trulia, and Redfin. Get Signed Up Now and get the latest Baltimore County tax and HUD foreclosures, REO properties, bank owned homes, and short sales being offered at HUGE price reductions and significantly lower than retail value. The Baltimore County is one of the best place to live in the country. It has numerous fun destinations and side attractions, which attracts visitors from other parts of the world. The area also has numerous buildings with great architectural designs and style. Everything about the Baltimore County is amazing. From nightlife, to numerous shopping destinations, restaurants, favorable weather, you can never get bored throughout your stay in this area. Baltimore County, as well as its seaport, exists closer to major Midwestern markets than any destination and port on the East Coast. The county was also known to have one of the second largest ports where immigrants gain entrance to the country. The port of the Baltimore County is one of the best naturally protected harbors in the whole world. The Delmarva Peninsula helps to shield the area, to prevent natural disasters such as hurricanes as well as tropical storms. The Appalachian Range also provides protection for the city. It protects area from cold during the winter that is capable of freezing the harbor. The current city was named after Lord Baltimore. It was also incorporated in the year 1729. Prior to colonists, the land was totally inhibited by lots of the Native American tribes, but they withdraw before Europeans came to settle in the area. The most remarkable period in the history of Baltimore was during the period of the war that took place in 1812. Just like every other city in America, the mystery of how the Baltimore County developed into a reputable destination is amazing. After the Great Baltimore, fire that took place in the year 1904 was recorded as a major disaster where over 1,500 buildings were destroyed, the incident soon turned into a miracle as the city grew from ashes into an attractive destination even after it was denied some support. Baltimore County is a famous destination that is situated in the northern part of the United State of America. It is the third most populated county in Maryland. The county seat of Baltimore is located in Towson, found just at the north-central section, which is north of the adjacent city of Baltimore. Baltimore County has an excellent weather condition. It receives 44 inches of rain every year as well as 20 inches of snowfall annually. The number of days with any measurable precipitation that this area experiences is 112. On the average, Baltimore County gets an average of 213 sunny days annually. The weather condition of Baltimore makes it an excellent location for comfort, fun, and business. Baltimore County provides the right shopping opportunity for both visitors and residents. You can find different items from fresh farm produce, jewelries, and a large variety of furniture. It is true that everyone has their own unique shopping style but the Baltimore County has all it takes to accommodate everyone’s needs. However, if you are looking for the best shopping or dining experience, then the shopping centers as well as malls in Baltimore will definitely satisfy you. You will surely get the best outlets, brands, and deals in this area. Baltimore County has some of the best restaurants in the country. From charming little Peruvian at the Puerto 511 restaurant, to the American dishes at the Salt Tavern, you will definitely find any kind of meal you plan to have for the day. If you are also in for a drink, you will never be disappointed as there are many local bars and coffee shops in the area too. The nightlife here at the Baltimore County is awesome. The area has the hottest nightclubs, bars, pubs, as well as different live music scene. The fun here at in Baltimore County is just endless and residents in the area, knows just how to make things happen. You can visit the Baltimore Tap House with your friends to enjoy the bar’s tap list or head straight to the Lighthouse Tavern to grab some Angus beef hotdog that is specially wrapped in a pretzel. The fun, during the night and day hours are endless as there are many options available to explore. 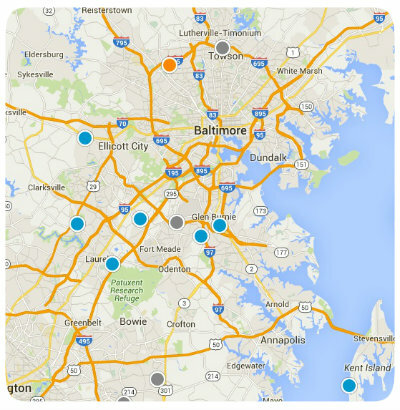 Baltimore County also has notable public, private, as well as tertiary institutions. Education is the bedrock of every society, and this county is known to provide the best. The schools are well equipped and situated in the right location with easy access. From the Baltimore Museum of Art to the Zoo in Maryland, the city truly has numerous side attractions and fun destination. You can visit the zoo in the area to learn about the characteristics of different animals or view the numerous attractions at the Museum in Baltimore. Baltimore is one of the main cities in Maryland with an attractive seaport. Sitting at the mouth of the Inner Harbor of Baltimore is Fort McHenry, which is the birthplace of America’s national anthem, “The Star-Spangled Banner.” This destination today, offers numerous shops, shacks, upscale crabs, as well as prominent attractions such as the Civil War- era warship, National Aquarium, which displays numerous collections of marine creatures. Be the first to know when new Baltimore County short sales, foreclosures, deeply discounted homes, and brand new hot properties come onto the market before anyone else - over 30% more listings than Trulia, Zillow and Realtor. Do you own a home in Baltimore County and want to find out instantly and completely free what it is worth in today's market - with absolutely no cost or obligation? SHORT SALE 3BR/1.5BA TOWNHOME IN CLAYBROOKE. NEAR ALL CONVENIENCES. SHORT SALE HANDLED BY PROFESSIONAL NEGOTIATOR. NEEDS WORK - PROPERTY SOLD IN "AS IS" CONDITION".